This breed was developed by a breeder (Eugenie Bernhard) in Hotot en Auge, Normandy, France. The Blanc de Hotot was created in 1912 after 10 years of breeding Checkered Giant, White Vienna and White Flemish Giant rabbits. They were officially recognised as a breed in 1922. Numbers dwindled in WW2, but the population soon recovered. This breed has white fur apart from the characteristic black circles around its eyes. 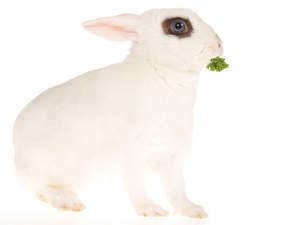 The circles around the eyes should be 0.32 to 0.64 cm to be considered a Blanc de Hotot. 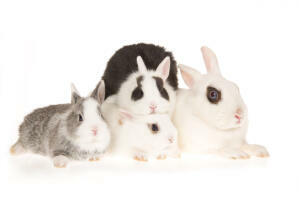 This breed is a docile breed that enjoys lots of affection. There are no variations in colour with this breed.